The Tara pump is a public domain pump that operates by the direct action of the operator. Since there is no mechanical advantage afforded as in lever action pumps, the effective depth of the Tara pump is limited to about 15 meters (50 feet). The operator lifts up and pushes down on a T-handle that is directly connected to the pump rod. This direct connection eliminates the need for bearings and axles, as on lever action pumps and allows water to be delivered to the spout on both the upstroke and the down-stroke. The pump rod of the Tara pump is made of sections of PVC which are sealed at each end with plastic fittings. These fitting are threaded, one male fitting at one end of the PVC section and one female thread at the other end. The separate PVC sections are threaded together to make a continuous air tight hollow PVC pump rod which is buoyant in water. The buoyancy of the pump rod reduces the force needed to lift the column of water on the upstroke. The PVC pump rod diameter is only slightly smaller (10-20mm smaller) than the diameter of the PVC riser main around it. On the upstroke, the piston assembly lifts water up the riser main and out of the spout just like any other piston pump. On the down-stroke, however, the large diameter pump rod displaces water in the riser main and again forces it up and out of the spout. This displacement characteristic of the Tara pump rod allows water to be drawn from the well on both the upstroke of the pump rod and on the down-stroke, as well. Since all below-ground parts are plastic or stainless steel, Tara pumps are suitable in corrosive water situations. Above-ground parts of the Tara pump are constructed of galvanized steel and may be locally manufactured. Tara shallow well hand pumps are VLOM pumps and are very easily installed and maintained by community members. Tara pumps can be installed in collapsible tube wells. That is, they may be installed in a well that has no well casing extending all the way to the aquifer. This is made possible by the inclusion, below the foot valve, of a lower well assembly. This lower well assembly includes a well screen, a sand trap, and a cutter. The Tara pump can be inserted directly into a coarse sand aquifer. The lower well assembly allows water to flow from the aquifer to the pump cylinder. 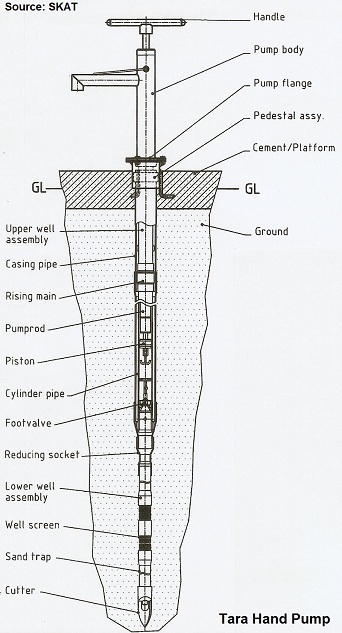 In effect, the lower well assembly performs the same function as the well screen in a rigid tube well casing. Only very simple tools are needed to assemble and disassemble Tara shallow well hand pumps. Village caretakers can easily work on and maintain a Tara pump. The open-cylinder design allows for easy removal of the piston assembly and the foot valve. Return to "Intro. to Hand Pumps" from "Shallow Well Hand Pumps"